Ernest Terah Hooley (1859-1947) bought and then floated companies that went on to become great British names; towards the end of the 19th century he had a personal fortune of millions of pounds but was then to be declared bankrupt. He was a serial fraudster, a man who bought up promising companies and then resold them to the public at hugely inflated prices. Once one of the most well-known men in Europe, the friend of kings and princes, he was declared bankrupt, served two prison sentences, and died, apparently penniless, at his Long Eaton home. 1871 Living at High Street, Long Eaton: Terah Hooley (age 32 born Long Eaton), Lace Maker. With his wife Eliza (age 32 born Thrumpton, Notts) and their son Ernest Hooley (age 12 born Sneinton). c.1878 Started in business with about £35,000 given to him by his father. 1882 Entered into partnership with his father as T. Hooley, lace manufacturers of Long Eaton. 1883 August. In court charged with assaulting another lace maker. 'son of Terah Hooley, a large manufacturer'. Concerns a trade dispute where the Hooleys were not part of the Nottingham Lacemakers Union. 1887 March. Summoned for assault on a man aged 73 at a political meeting. 1888 Bought Risley Hall in Derbyshire for £5,000, possibly with the assistance of an inheritance from his mother. 1891 Living at Risley Hall, Derbyshire: Ernest Terah Hooley (age 32 born Nottingham), a Lace Manufacturer and Employer. With his wife Annie Maria Hooley (age 32 born Boston) and their children Terah Franklin Hooley (age 8 born Long Eaton), Eliza May Evelyn Hooley (age 7 born Long Eaton), Grace Annie Mildred Hooley (age 5 born Long Eaton), Violet Irene Constance Hooley (age 3 born Long Eaton), Dorothy Winlaw Hooley (age 2 born Long Eaton), Marjorie Idonia Hooley (age 8 months born Risley. Also his relative John Adam Wheatcraft (age 25 born Matlock) and six servants. 1892 The partnership was converted into a limited company. Started working as a stockbroker. 1892 Birth of half-brother Basil Terah. 1895 Concentrated on promotion of companies. 1896 Moved to London where he continued to work as a stockbroker. Involved in buying and selling on the Bovril Co, Coventry Machinists Co, Cycle Manufacturers Tube Co, Dunlop Pneumatic Tyre Co and Dunlop Pneumatic Tyre Co (France), various overseas subsidiaries of Humber, Raleigh Cycle Co, Schweppes Ltd, Singer Cycle Co, Swift Cycle Co and Trent Cycle Co.
1896 Of Risley Hall, near Derby. Stockbroker. Subscriber to shares in the Dunlop Pneumatic Tyre Co at its formation. . Hooley bought the Dunlop Pneumatic Tyre Company for £3m and then floated Dunlop as a public company for £5m. 1896 Hooley created the Trafford Park estate in Manchester, the world’s first industrial park. Originally some 1,183 acres of parkland with deer, it was purchased by Hooley for £360,000 from Sir Humphrey Francis de Trafford, and he set about developing Old Trafford as an 'industrial estate' which was, at the time, a radically new concept. 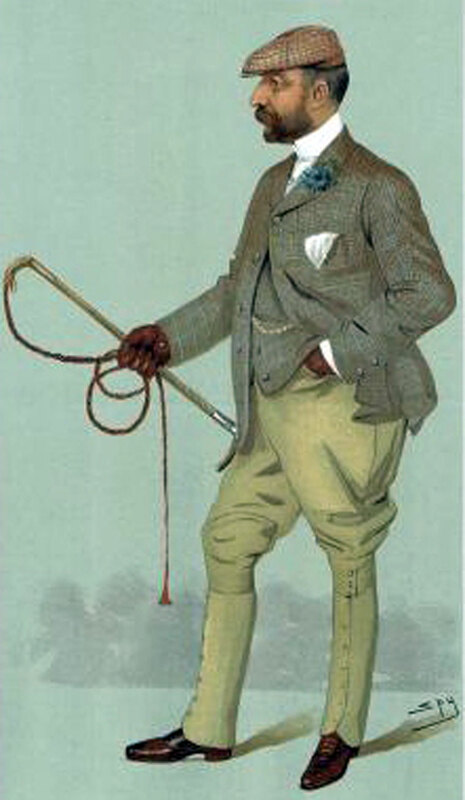 1897 Appointed High Sheriff of Cambridgeshire and Huntingdonshire. 1897 Ernest Terah Hooley, Esq., J.P., to be Deputy Lieutenant of Cambridge. 1898 Ernest Terah Hooley, Esq., to be Deputy Lieutenant of Huntingdon. He was involved in the finance and problems at Humber. 1898 Declared bankrupt for the first time. The Official Receiver indicated that large disbursements had been made to various people in connection with the companies promoted but there were insufficient details recorded to know precisely what had been done. The Humber company closed down their overseas operations. 1901 Living at Papworth Hall: Ernest Terah Hooley (age 42 born Sneinton, Notts), a Company Promoter. With his children Terah Franklin Hooley (age 18 born Long Eaton), Grace Annie Hooley (age 15 born Long Eaton), Dorothy Hooley (age 12 born Long Eaton), Marjorie Hooley (age 10 born Risley), and Ernest Terah Hooley (age 8 born Risley Hall). Also two visitors and twelve servants). 1901 December. Removed from the list of Deputy Lieutenants for the County of Cambridge and Huntingdon. 1903 His wife gains £100,000 through an insurance policy on the life of Adolphus Drucker M.P. who was (possibly) murdered in New York. 1904 Harry Lawson and E. T. Hooley were tried in court for fraudulently obtaining money from Alfred John Paine and other shareholders in connection with the Electric Tramways Construction and Maintenance Co; Lawson, after representing himself in court, was found guilty and sentenced to one year's hard labour; Hooley was found not guilty. 1912 July. Bankrupt for the second time. Thomas Llewellyn Damery was his private secretary and also went bankrupt. 1917 October. Charged with assaulting a Long Eaton solicitor but the charge later withdrawn. 1922 June. Appeal against conviction and sentence dismissed. 1925 September. Announces conversion to the Catholic faith. 1926 April. Alleges fraud against a solicitor but later withdraws the case. 1927 July. Brings legal case for commission. 1927 November. Received into the Roman Catholic Church at Derby. 1928 March. A witness in a legal case concerning some commissions. Admits to being the originator of the scheme. 1929 February. Wins legal action for unpaid commission of £2,200 for the sale of quarries. 1929 Risley Hall has been broken in to in the past so Hooley employs an ex-policeman and a large dog to patrol the grounds and they detain an intruder. 1929 Mentioned as a generous benefactor to the parish church of Risley in the past. 1931 June. ETH in court being sued for £5,000 damages. 1932 January. In court over doubtful share dealings in Longford Trading Co.
1932 May. Concerning a gold plate he had presented to St. Paul's Cathedral 35 years ago and the church wants to melt down and produce other items. 1932 November. Sued for £46 6s for work at Risley Hall. Dispute over whether he or his wife ordered the work. Hooleys lose. 1934 June. Sued by jewellers for unpaid bill of £39 15s and he loses. 1935 April. Involvement in the case of Frederick William Kirkwood, an estate agent who went missing over debts. 1935 December. Involved in car crash but unhurt. The car was 'a big saloon model'. 1936 July. Settles claim for £750 against him by firm of solicitors in Derby. 1938 July. Loses claim of commission of £4,775 in court case. 1940 March. Takes legal action against an attack by a dog on his fowl-pen containing 18 Rhode Island red pullets. Ernest Terah Hooley, garage proprietor, of 207 Bypass Road, Chilwell. 1940 June. Bids £100,000 for the Bestwood Estate but not accepted. 1947 February 12th. Having returned to property dealing, he died, apparently penniless, from complications associated with acute bronchitis at 197 College Street, Long Eaton. 1947 February. Obituary. 'He Juggled With Millions. Ernest Terah Hooley, whose financial transactions some years ago were on an immense scale, has died, aged 88. His life was crowded with incidents. From earning 30s a week his father's lace mill in a Derbyshire village to became one of the most powerful financiers of the century. It was said he owned £10,000,000 worth of property. 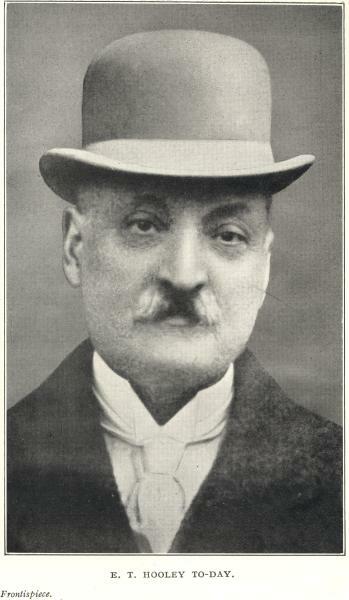 Hooley saw his fame and wealth totter when he was sentenced at the Old Bailey in 1922 to three years' penal servitude for frauds connection with the purchase of shares and debentures of Jubilee Cotton Mills Ltd. "Money not difficult to get hold of," said Hooley. "I have always found it harder to keep. I made millions and spent them. There are men whom I raised from nothing and made millionaires. The moment I was down they turned and kicked me. Well I have lived to see most of them under the sod." This page was last edited on 18 November 2016, at 09:17.